Bitcoin (BTC/USD) collapsed further this past week on the continued volatility spike that followed historically low volatility in October and much of the first half of November. BTC/USD's pronounced break two weeks ago beneath the 20-month long uptrend and horizontal support (on the weekly chart) has sent BTC/USD decisively below the 78.6% Fib retracement of the rally into December 2017. However, those looking to short still should note the bounce in progress off an extremely oversold reading of the weekly and daily Stochastics at just above 1 reached yesterday. Zero is the lowest level Stochastics can go by definition, and weekly and daily Stochastics readings below 10 are rare enough, let alone those hovering around 1. 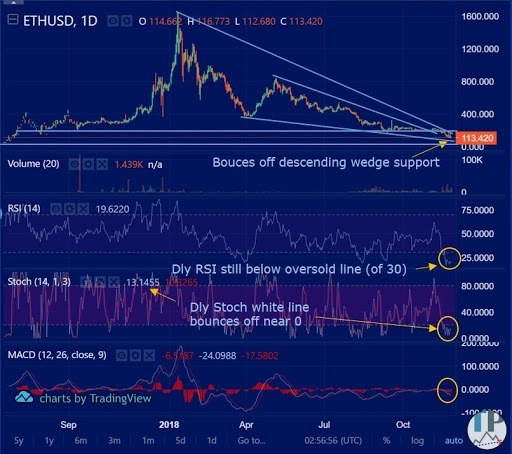 Bulls will for the most part wait for the weekly and daily RSI, Stochastics and MACD to perk up again and recover from oversold ranges, before anticipating a more sustainable bounce. BTC/USD has now unwound pretty much all of the rally from the second half of last year. 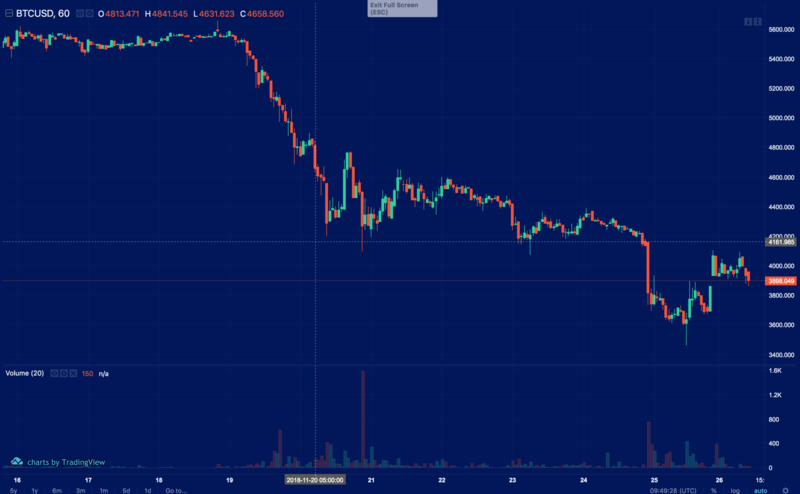 Ethereum (ETH/USD) has further collapsed for a second straight week of heightened volatility after a period of unusual calm. Notably, ETH/USD has now unwound all of the rally from the second half of last year (and then some). 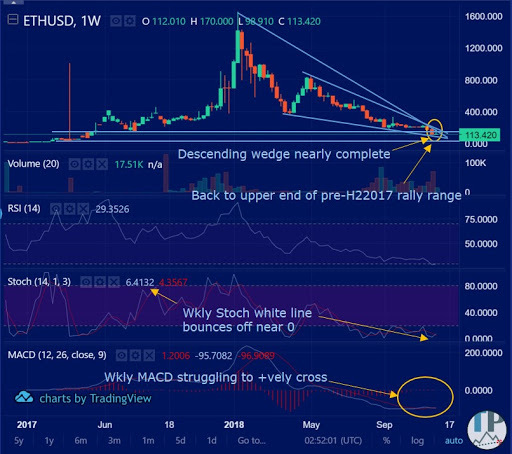 The weekly chart does not suggest any other major horizontal support levels as ETH/USD ran up quite quickly from the beginning of 2017 to the whole figure levels of 100 and 200. After the massive drop of the last few weeks, the risk:reward ratio is increasingly moving in favor of the bulls who will note the bounce in progress off an extremely oversold reading yesterday of the weekly and daily Stochastics. XRP (XRPJPY) succumbed to the broader crypto market selloff this past week, breaking decisively below the psychologically key 50 whole figure level, and now nearing the 2018 low. 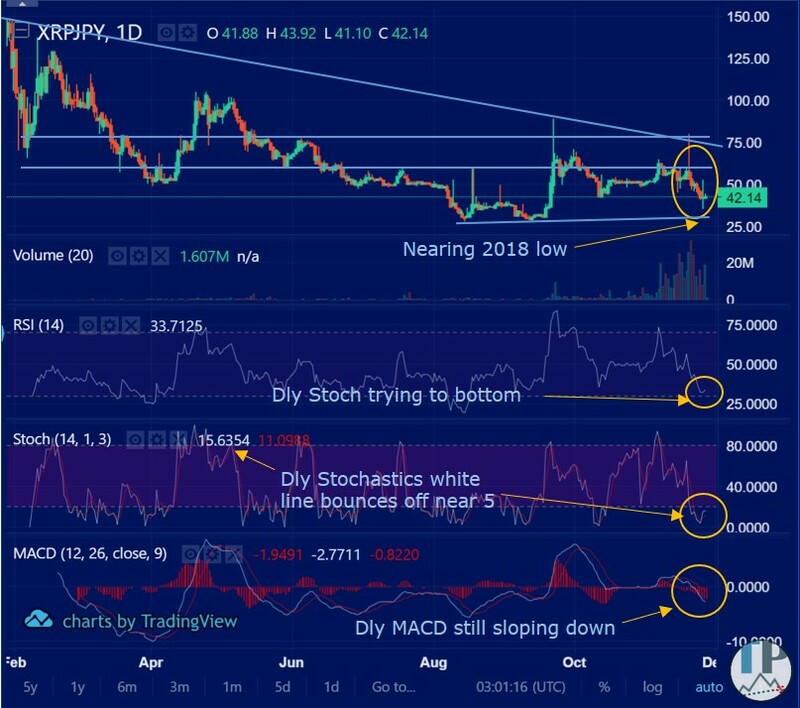 Key for bulls will be whether XRP/JPY holds the slightly rising support line connecting the August and September lows. After the massive drop of the last few weeks, risk:reward is again increasingly moving in favor of the bulls here who will note the bounce in progress off yesterday’s extremely oversold reading of the daily Stochastics at just above 5. 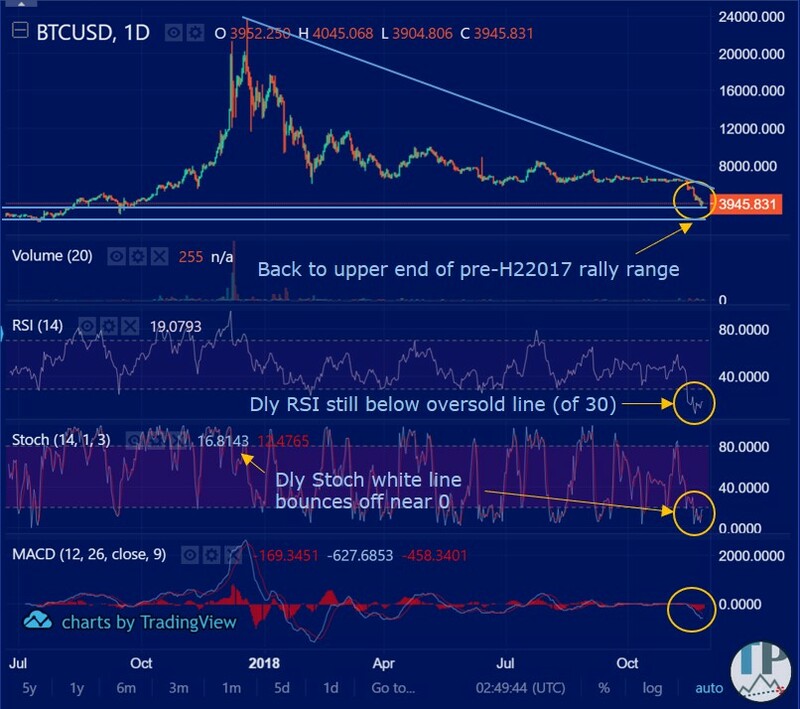 Bulls will be waiting for the daily RSI, Stochastics and MACD to show signs of action before anticipating a sustainable bounce. Darren Chu, CFA, is the founder of Tradable Patterns, publisher of daily technical analysis on Bloomberg, Thomson Reuters, Factset, Interactive Brokers, Inside Futures, and other partner websites. Before the launch of Tradable Patterns, Darren served as IntercontinentalExchange | NYSE Liffe's country manager for Australia, India, and the UAE, expanding his role to look after Liffe business development in APAC ex-Japan/Korea until his departure mid April 2014. Previously, Darren was with the TMX Group | Montreal Exchange, marketing Canadian futures and options across North America, London, Singapore and Hong Kong. Darren also launched and managed CMC Markets Canada's Chinese marketing and sales team, along with educational offering. Visit www.tradablepatterns.com for more information.